At Kaydon Bearings, we apply engineering experience and expertise to solve the world's most demanding bearing challenges. 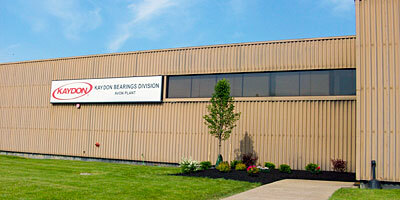 Kaydon manufactures and repairs bearings at seven ISO 9001:2008 facilities in North America, including the former Avon Bearings location. Avon Bearings was acquired by Kaydon in 2007. Kaydon engineers are ready and willing to find the ideal application-specific solution in thin section or slewing ring bearings from 3/4" to 282", whether you need one or thousands. Kaydon's Bearing Remanufacturing Program gives new life to slewing rings of any design, configuration, or original manufacturer, from 10" (25 cm) to 20' (6.1 m) in diameter. Kaydon remanufactures some 1,500 slewing ring bearings each year for construction machinery and other heavy equipment, at cost savings of up to 50% compared to a new OEM bearing. Kaydon bearing solutions also include replacement slewing ring bearings of any configuration, manufactured to original specifications, at substantial savings compared to OEM bearings and a one-year warranty. Both remanufactured and replacement bearings are typically delivered weeks earlier than OEM bearings, with performance that meets or exceeds the dynamic life and static capacity of the original. Kaydon's 67,200 sq. ft. Avon, Ohio plant manufactures large diameter ball bearings and slewing rings up to 20' for the renewable energy, heavy equipment, defense, and industrial machinery markets. The facility also has 24,000 sq. ft. dedicated to the repair and remanufacture of slewing ring bearings. ©2010– Kaydon® Bearings, an SKF Group Company. All rights reserved.